I’ve been wanting to try Yoga for such a long time but where I live it never seemed to be at convenient times or places. I’ve just started working remotely and one of the few downfalls of working from home is that I’m getting less incidental exercise (but that’s a whole other blog post). Now that my schedule is loads more flexible I’ve started looking at adding extra bits in to my fitness routine to make sure I’m keeping active. I happened to be reading a local business publication (CityX) recently and they had a feature on a new yoga studio in Lincoln, Hotpod Yoga, this seemed to be exactly what I was after. You can just register and book in to sessions as you need to without a membership so I went for it, registered and paid for a single session before I had chance to talk myself out of it! 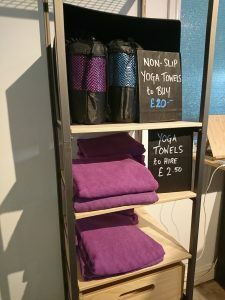 Preparing for hotpod yoga – what to take?! Luckily there was a little bit of advice on the hotpod yoga website so I could prepare in advance and it’s pretty simple so you don’t need to worry. I made sure I wore high waisted yoga leggings (so I didn’t give anyone an eye-full) and a sports vest. But really you just need something comfortable and easy to move in. You take your shoes off inside the pod so you don’t need any fancy footwear. I also made sure I tied my hair back and wore a headband – cos you know sweat in the eyes ain’t great. I arrived a few minutes early at the studio for 7am and was warmly greeted by Lucy, the instructor for the session. She put me at ease straight away, explaining everything clearly and guiding me up to the pod. There is a place for you to securely stow your valuables and shoes before you make your way in to the dome. As you would expect the pod was hot as it is warmed to a toasty 37 degrees – I could have easily gone for a nap in there. The pod has a lovely hazy atmosphere with a calming scent, music and a nice ambient light which really sets the tone for relaxation. Lucy took us through the various movements and flow in hushed narrative, she helped correct my posture in a personable way and made the session thoroughly enjoyable. Explaining enough about each movement without ruining the ambiance. I struggled with some, OK most, of the movements but I’m sure over time I’d loosen off. By the end of the session I felt hot and well stretched, but also very calm and ready for my day (and a shower!). All in all, a pleasurable experience and definitely worth a try if you’re from the Lincoln area. The session cost £10 however there are a number of other offers available. Personally I enjoyed it enough to want to attend regularly so I will look at the monthly membership deals. You can find more information on the hot pod website. This post is not sponsored and reflects my own personal honest opinion however affiliate links are used to support the running costs of this blog where appropriate.